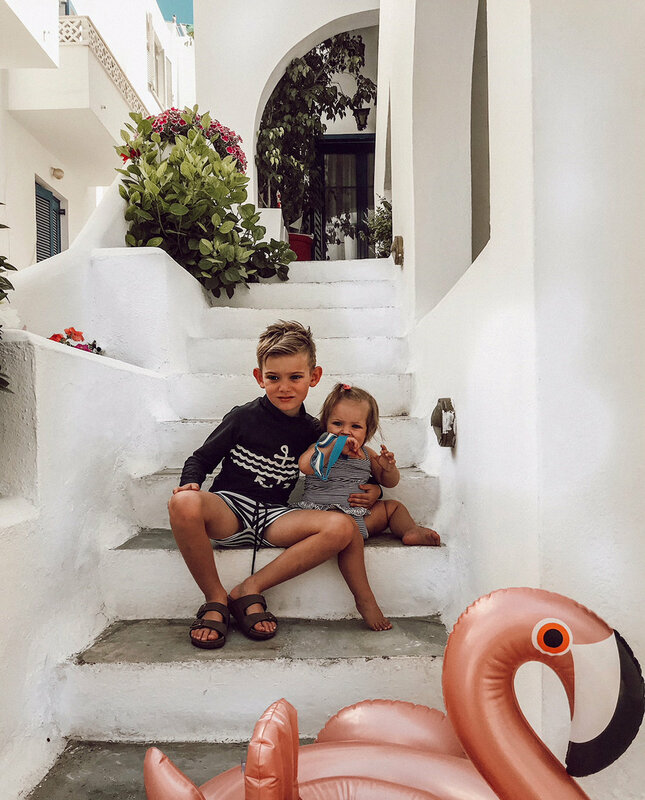 If there was ever an island made for families, then Naxos is it. And I don’t mean ‘All-you-can-eat, Disneyland-style, Kids Club, “could be anywhere” resort kind of family holiday’; I mean family friendly with just the right amount of relaxation, adventure, culture, history and fun. 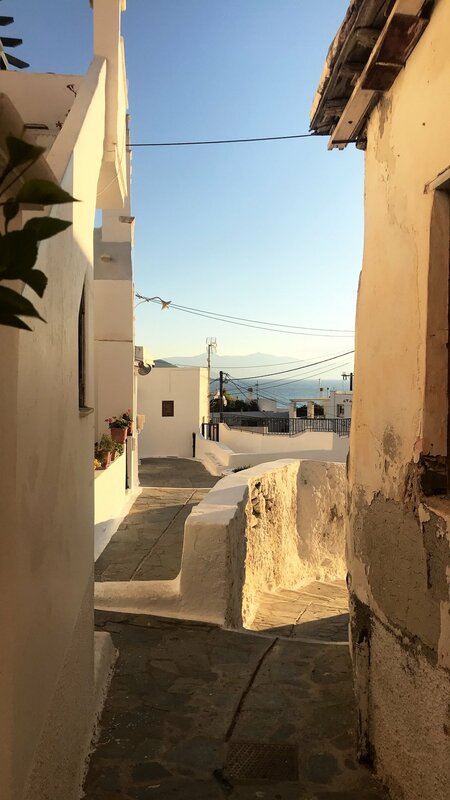 Naxos Town itself is a gorgeous historical gem consisting of laneways, fishing port, restaurants and shops. There is so much history here and Archie loved learning about the Pirates that took over the town and castle. The island has many beautiful beaches and villages with a very relaxed holiday vibe. SAINT GEORGES | The busiest but probably the most family friendly beach with fine sand and shallow waters as far as you can walk out- perfect for kids. There are some great cafe options and reasonably priced lounge chairs/ umbrella to protect from the sun. It did get quite busy and the middle of the day was really too hot at the end of July, but late afternoon is just gorgeous we often had dinner on the beach while the kids play in the sand. In the evening it’s much more chilled with restaurants and bars set up. This beach is only 300 metres walk from the capital its a great place to stay when in Naxos. AGIA ANA | A pretty little beach about 6kms from Naxos Town. Nice fine sand with a pretty port of fishing boats. It can get quite choppy and when we were there is was very windy. The water drops off a little too deep for my liking with a toddler, which is why I would recommend Saint Georges over this one for peace of mind. I did have the most delicious fresh fish of the entire trip here though. Shame I ate it with mouthfuls of sand, because #mumlife and wind is not the best combo. Saved by the cocktails though! PLAKA | A very long beach (about 4km) about 15-20 minutes drive from the town. Lots of accomodations, great food, playgrounds at restaurants- this beach is VERY family friendly. It also used to be a nudist beach (parts still are) so maybe keep that in mind. Ha! We ate at the mexican restaurant here on the beach – food and margaritas were delicious. We stayed 5 nights in Naxos Town at the lovely Argo Boutique Hotel Our room had a hot tub on the terrace and view over the town. It was a hundred metres walk to the beach, had a fabulous buffet breakfast and very personalised service. Walking distance to everywhere- perfect location for a fun beach/old town holiday. The second week we chose to stay at MY VILLAS about 5 minutes drive rom the town in between Saint Georges and Agia Ana beach by the airport (hardly used small airport). It was 2br with a private pool and felt good to have some space after living in the one room for a few weeks. You do need a car here otherwise it would feel a little isolated as nothing is really walking distance. Good location for exploring the island though with 10 minutes drive to any beach, the town or the port. Also 3 minute drive to the water park which was a favourite of Archies. Apeiranthos village | Considered the crown jewel of Naxos. About 35km from the capital it boasts magnificent views of the Naxian mountain ranges. Lots of restaurants, local artist shops and beautiful architecture.